Here we go again. A new season means a new fly box experiment. *I carry a dedicated dry fly box, but like to have a few in the box I use most frequently. I purchased this previously owned fly box for $35. In terms of size, I liked this box. It held lots of flies (of various sizes) and it even fit in the pocket of my waders. It crushed both Bugs and Butterflies, though. Bomber storage was non-existant. After sitting in a drawer for several years, I traded this box for an old Scientific Anglers (Hardy) trout reel. and the foam slots were too flimsy. I traded British elegance for cheap Chinese functionality with this box ($10). It held smaller salmon flies well. Flies from size 1/0 to size 2 killed the slotted foam slots over time, however. It was a good size for the smaller outer pocket of my sling pack, but was too large for my waders pocket. Unlike with the Wheatley, Bugs and Butterflies stayed intact. Bombers fit in the right side, though the hackles got pushed around a bit by the raised foam hook holders. The biggest strike with this box was the swing leaf. It was very flimsy. The adhesive wore off quickly and the thin plastic eventually ripped. Flies could only be stored on one side of the leaf. Plus, I couldn't find a generic swing leaf and the OEM C&F leaf was almost twice the price of the box itself ($18). This box got pretty beat up after only one season. Nubby Tack...a waste of a perfectly good patent. I bought this box at Cabela's, though similar boxes can be found just about anywhere for about the same price ($15 or so). The box itself is very large, bigger than the phony C&F. It fit in my sling pack, but only in the large pocket. 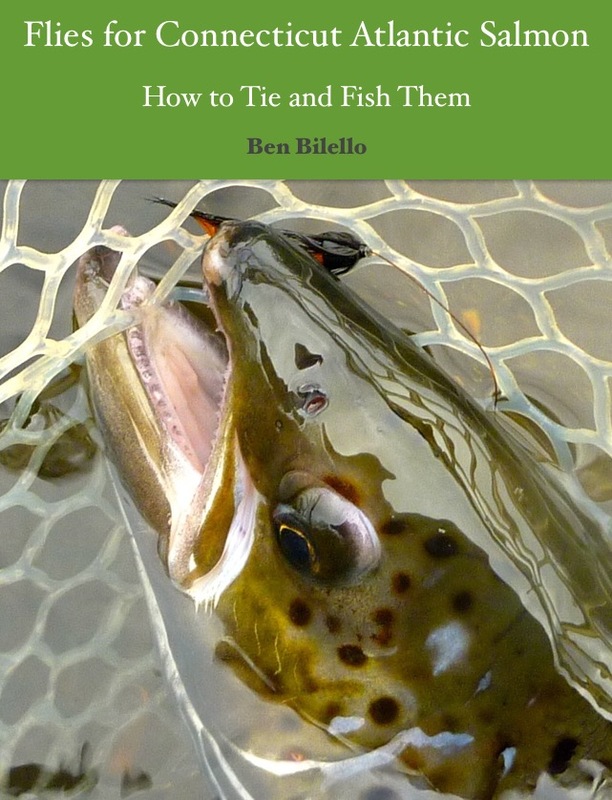 It holds large and small salmon flies with no problem, though it seems to be better at holding larger flies. Flies can work themselves loose if the box is dropped, but I can only recall having that problem once. Bugs, Butterflies, and Bombers were all held safely and securely. Honestly, I still like this box. I'll probably continue to use one to house flies tied on larger double hooks. I really like Nubby Tack. Too bad Millstream's bread and butter is their fly box personalization more than fly box innovation. A Millstream box with slots to add a swing leaf would be awesome. I'd love to Frankenstein a box that includes both Nubby Tack and a slotted foam swing leaf. In its current form, however, this box is too bulky for the amount of flies it holds. 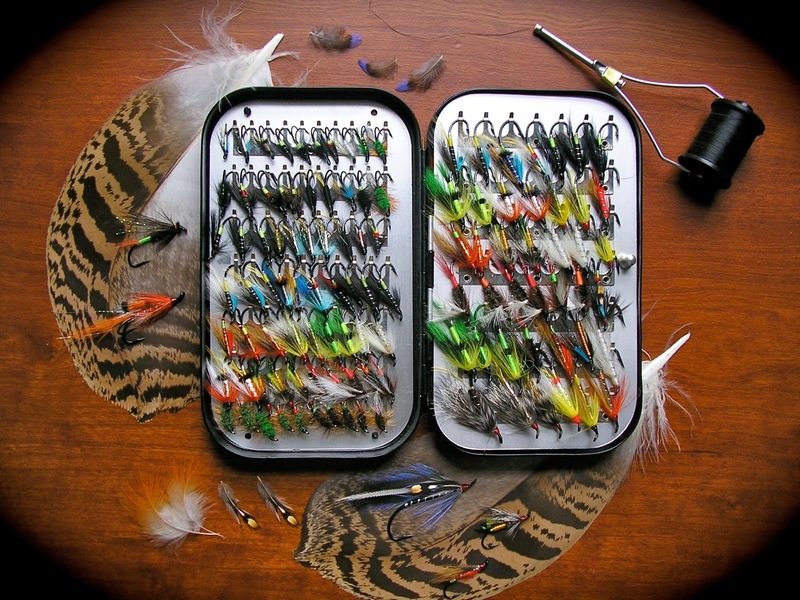 The 2014 Fly Box (pictured above) comes partly from Cabela's. The box itself is a Cabela's waterproof streamer box. Another style of Chinese C&F knockoff, it can be found plenty of places, including eBay. I paid $9.95 for this box. The slotted foam leaf was purchased on eBay for $8.95. It is far sturdier than the leaf in my previous fake C&F box. There are no adhesives, which is a huge plus. The leaf has three tabs which snap right into the box and is easily installed and removed. The leaf is double sided, which is another bonus. It seems like this box is a little deeper than my old C&F knockoff. The right side of the box has more depth than the left side. As such, Bombers are stored safely on the far right, while Bugs and Butterflies are stored safely on the corresponding side of the leaf. The left (shallow) side of the box houses standard wet flies, while the corresponding side of the leaf holds small wet flies, both double and single. This is not a perfect solution. This box was not made to hold flies this size when a leaf is used. I don't have to sit on the box to close it, but I do have to force it shut a bit. It doesn't seem like the flies on the shallow side suffer much though. I guess we'll see how it fares over the course of a season. 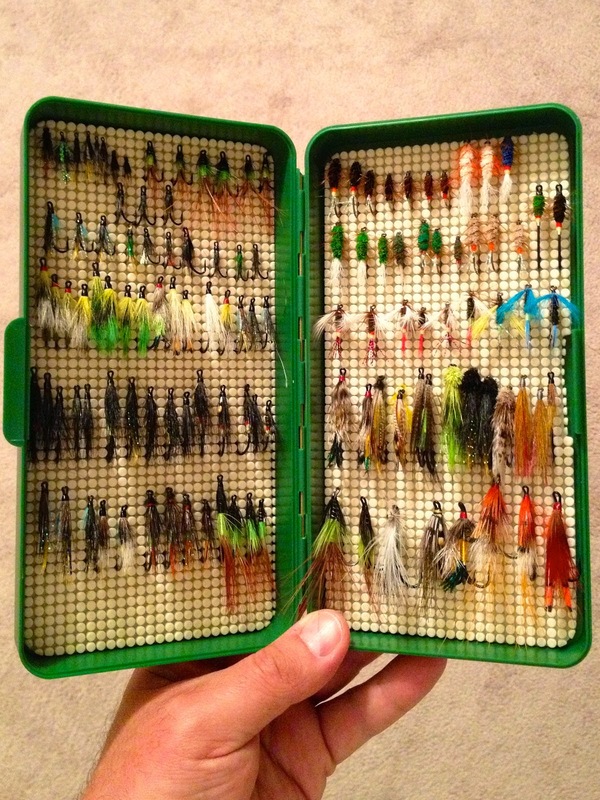 In the meantime, I'm going to keep my eyes peeled for potential 2015 fly box candidates. I have a box I'm happy with for the bulk of my salmon dries. I want a box in which I can keep a few dries, but mostly wets (since I fished wets far more often). If I can keep the bulk of the flies I use the most in one box, I can keep the secondary boxes out of reach (i.e. in a backpack) and only use them when absolutely necessary. I'm getting sick of carrying around a million fly boxes. This new box should do the trick for now. The only question is how well will it hold up over the course of a season? The previous one didn't fare so well, but I think the current one is sturdier.